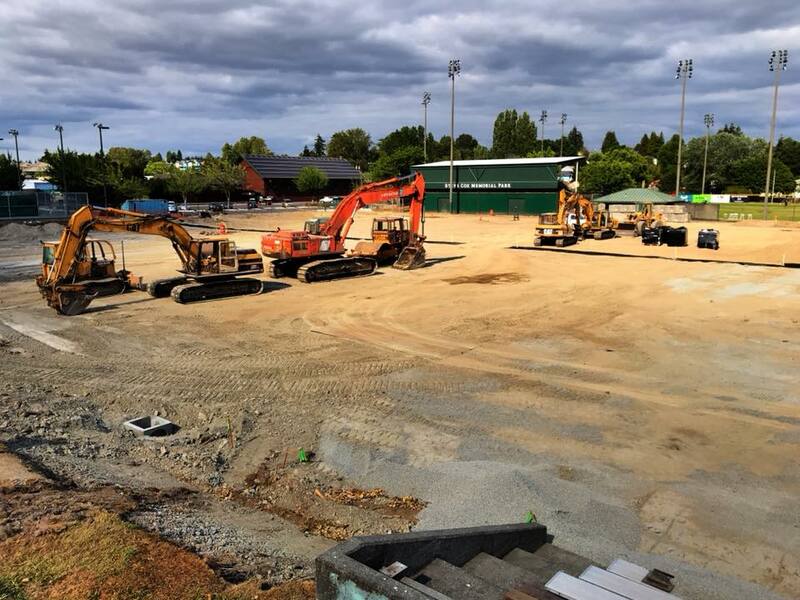 Earth moving equipment working to transform the ballfields at Steve Cox Memorial Park in a $3.1 million project expected to be complete by October. The $3.1 million dollar ball field improvement project at Steve Cox Memorial Park is well underway with earth moving equipment having taken off the surface soils and a stair case to the south already installed.The goal of the project is to improve the conditions and expand the playability of the ballfields currently referred to as Fields #2 and #3, adjacent to and outside of Mel Olsen stadium. The project will construct a multi-use synthetic turf athletic field with LED lights and a ten-foot-wide paved walking path around the field perimeter. The field in-fill will be a rubber turf material coated with a colorant and encapsulated with a polyurethane coating. This material was selected to help reduce on-fieldctemperatures and the overall environmental impact of the in-fill. The field will be lined for soccer, lacrosse, and baseball (two diamonds) and can be adapted for youth games and practices for multiple sports, such as U12 and under soccer, ultimate Frisbee, football, lacrosse and other field-based sports. King County Parks will also renovate the existing bleachers and backstop in the southwest corner of the park. One of the oldest parks in the county, Steve Cox Memorial Park is home to ballfields, basketball and tennis courts, play and picnic areas, a foot reflexology walking path, and Mel Olson Stadium. The iconic White Center Community Center, also known as the "Log Cabin" is a King County landmark built as part of a Works Progress Administration project in 1940, continues to serve area youth through King County Parks’ White Center Teen Program, which provides after-school recreational programming to neighborhood youth aged 12 to 19. Formerly White Center Park, the park was renamed Steve Cox Memorial Park in 2007 in honor of a fallen King County Sheriff's Deputy who was also a beloved community leader.